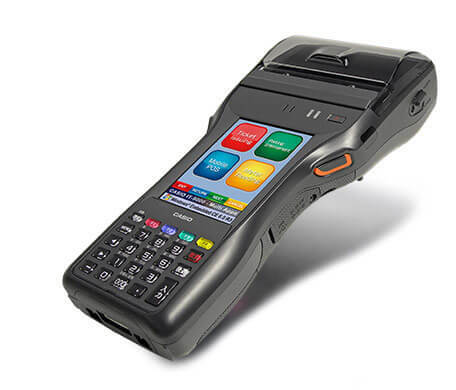 The new model of the proven CASIO IT-9000 mobile computer offers everything you need for mobile entry of data and for printing receipts, with a built-in receipt printer, RFID/NFC functionality, GPS, 2D image scanner, digital camera and magnetic card reader. This robust multifunctional terminal is perfect for use as a mobile cash register within delivery logistics and outside sales, for ticket sales at events or in car parks, and for use by railway and transport companies. The performance and compact exterior of the CASIO IT-9000 make it a captivating product. The previous model—with identical housing—was awarded the iF product design award in 2013. Thanks to its integrated high-speed printer, 2D imager, digital camera and UMTS, the elegant device has everything you need to enter data on the go and print receipts. The CASIO IT-9000 has been optimised for one-handed operation and has two buttons on the side for triggering the scanner. Its slim and ergonomic form allows the hand to remain relaxed while logging data and printing receipts and guarantees effortless operation. 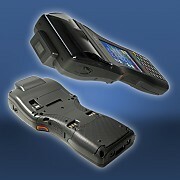 The application determines whether or not a laser scanner for barcodes or an imager for common 2D codes is required. Both reading modules are extremely high-performance. Integrated RFID/NFC functionality, a digital camera and an optional magnetic card reader allow the fastest possible logging of customer information and even photographic documentation. The print unit and paper tray of the CASIO IT-9000 are seamlessly integrated into the handheld housing and are well protected against external influences such as impacts, dust and rain. 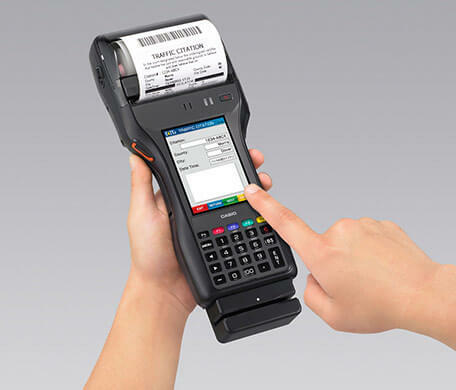 The printer works very quickly and has some special features that perfect the receipt or label printing process and make the device easier to handle in mobile operation. 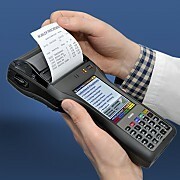 The CASIO IT-9000 is ideal for use as a mobile cash register with receipt printer within delivery logistics. Integrated SAM slots (Secure Access Module) enable secure protection against tampering, ensuring adherence to new legal requirements relating to mobile cash register systems that come into force in 2017. Despite its low weight, the multifunctional terminal is resistant to external influences. Its housing is made of an elastic plastic material and can withstand falls onto concrete from a height of 1.5 metres. The device offers protection against dust and splash water according to the IP54 protection class and operates at temperatures between -20°C to +50°C. 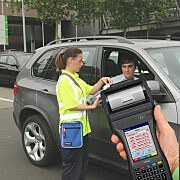 Security staff can use GPS to document the position of a parking offence, for example, and to photograph it using a digital camera. The receipt printer generates the parking ticket immediately. 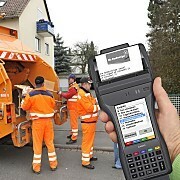 Within the waste disposal sector and utility supply services, consumption data can be recorded on the move and printed out. When used in service organisations, reports can be printed on site and receipts can be issued for payments. 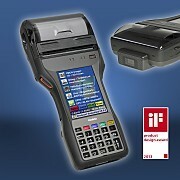 The CASIO IT-9000 with integrated RFID/NFC reader enables electronic tickets to be checked in no time. 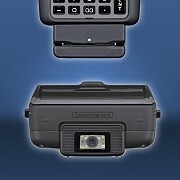 An integrated 2D imager also reads tickets printed from the Internet and tickets on mobile phones. More than 40,000 devices are used in delivery companies and service organisations around the world, as well as in ticketing services for national railways and regional transport companies. The PIN pad is linked to the CASIO IT-9000 and can be used to take payments (e.g. by debit card) immediately. 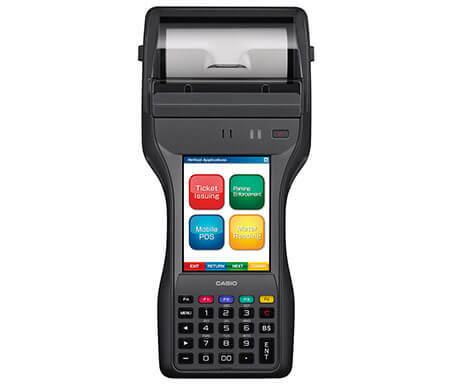 To process transactions securely, the PIN pad uses the CASIO IT-9000 to send the encrypted payment data to the authorisation systems in the credit services sector via UMTS. 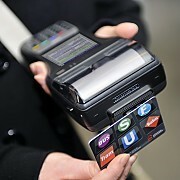 Successful payments are confirmed on the PIN pad and a receipt can be printed. Due to its versatility, the CASIO IT-9000 multifunctional terminal is particularly ideal for delivery services and ticketing. Datenerfassung via Scanner, Imager, Kamera, RFID/NFC und Magnetkartenleser, Unterschriftserfassung auf dem Display, sowie mobiler Druck von Belegen. 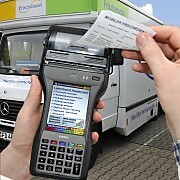 Datenerfassung via Scanner, Imager, Kamera, RFID/NFC und Magnetkartenleser, sowie mobiler Druck von Belegen.  Material- bzw. Ersatzteilbestellung via Mobilfunk. Mobile Datenerfassung und Belegerstellung bis hin zur Online-Zahlungsabwicklung. Ideal für alle Aufgaben im Bereich der mobilen Datenerfassung und Belegerstellung bis hin zur Online-Zahlungsabwicklung. Integrierte SAM-Slots (Secure Access Module) ermöglichen sicheren Manipulationsschutz. Material- und Teile-Identifikation, Bestandsführung, Auftragsdatenverarbeitung, sowie mobiler Druck von Belegen.